In my first year of using firewood as a major heating source, I learned a lot – and of course I still am learning and refining. As a 59 year old woman of medium size, I was and still am on the lookout for tips and tricks that will make any part of the process of gathering, cutting, splitting, stacking, moving firewood easier, faster and more efficient. I've spent hours reading and learning from various web sites. (woodheat.org was the best, of course!) Whether young or old, male or female, slight or large build, efficiency is what you strive for. 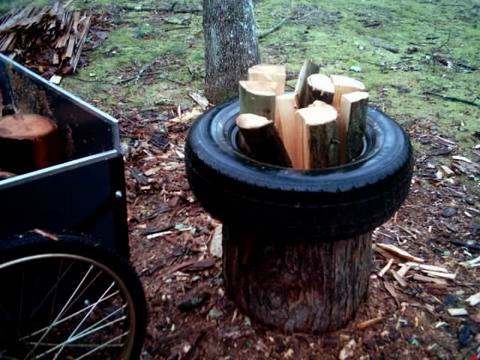 One great tip I stumbled upon somewhere on the net was using tires as a splitting aid. Yes, that's right, those old tires people throw out and the ones tire stores now charge you to dispose of when you buy new tires. I have a large splitting block, about 18 inches high and 20 inches in diameter. After months of bending over to pick up split pieces, pick up and reset pieces that simply flew off the block as I was learning to aim the splitting maul (big learning curve there), picking up and putting down wedge and sledge for those more difficult pieces, bending over and slipping slivers of wood under one edge of those angle-cut logs that won't stand up, my back was screaming after only an hour and a half. A well-placed tire to contain the pieces I'm working on became the cure for my aching back. Kathy's splitting set-up. Note the upturned plastic bucket Kathy uses as a tool table and a place to lean the maul. No bending!My tire is a 15 inch and sits on my block. 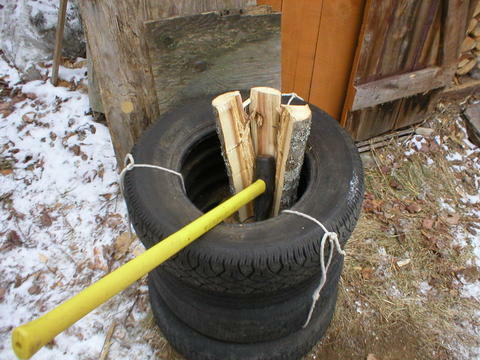 I can place one large log or two or more smaller diameter logs inside the tire opening. When I take a swing the pieces stay in the tire instead of flying off. If you miss with a swing, the piece stays there – no bending over to pick it up and place it on the block (again and again and again, depending on your level of aiming skill). Also, if you miss a swing, the tire absorbs the shock and you don't have to struggle to get the maul out of the block. It also helps protect legs and feet from stray maul strikes. 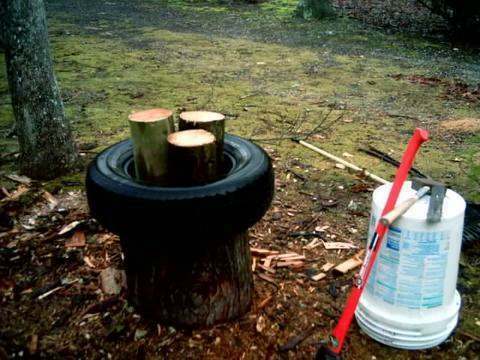 With larger pieces that you want to split several times into smaller sections, the pieces stay in the tire as you continue to split the wood to the size you want. After splitting, I simply chuck the pieces from the tire right into my garden cart next to the work station. No bending over innumerable times to pick up split pieces any more! One thing should be mentioned about using tires. Tires collect water and mosquitoes love to lay their eggs in stagnant water. Either drill a few holes or cut a few slits in the down side of your tires to allow for drainage, or you'll be doing the skeeter-swatting-maul-swinging dance, which isn't very pretty. Ed note: I use a hydraulic splitter for firewood, but I use a brick oven for baking so I need to split kindling and small pieces to feed it. I use a fairly small block and an ATV tire, which is the perfect size for splitting kindling from larger, but already split, firewood.